Police arrested several leaders of the Telangana Rashtra Samiti including 15 MLAs of the party on Friday morning as they were trying to march to the Andhra Pradesh assembly to press the demand for a separate Telangana state. Normal life in parts of Hyderabad came to a standstill with police shutting down five flyovers and several roads within two-km-radius of the assembly. Tension prevailed at the Osmania University for the third consecutive day as police sealed the campus to prevent students for taking out the rally. Police and student clashed when the latter pelted the former with stones. Some students have been arrested when their tried to rush towards the state assembly building. More than 15,000 policemen and personnel from central paramilitary forces have been deployed as part of the massive security arrangements. Only legislators, officials and media personnel were allowed to proceed towards the assembly on Friday morning. Schools and colleges in the twin cities of Hyderabad and Secunderabad remained closed. Police have imposed prohibitory orders banning assembly of five or more persons and have ordered shutdown of all liquor shops, bars and pubs in Hyderabad and Cyberabad police commissionerates. TRS leaders including Harish Rao who was among the arrested MLAs told this correspondent that the presence of the speaker inside the assembly at 6 am shows the success of the protest. The speaker, Nadendla Manohar, reached his office early morning in wake of the protest. Unprecedented security measures put in place in the city reflected the state government’s determination to foil the planned agitation. Common road-users were the worst-hit as five major flyovers were sealed off. Roads were also closed with barricades and barbed-wire fencing at more than a hundred places, forcing the commuters to take long, excruciating detours. This time around, the administration is strict. They have sent across a clear message that anyone attempting to take out a march on Friday would be severely dealt with. The police commissioner has already said that protesting government employees and students will face uncertain futures at work and academics (respectively) as serious cases would be booked against them. A wave of protests cut across the Hyderabad, only to be suppressed by the police with a spree of arrests. A BJP protest led by senior leader and former union minister Vidyasagara Rao near Indira Park turned violent following a clash with the police. The cops resorted to caning to disperse the mobs, resulting in minor injuries to a few including Vidyasagara Rao. BJP state president G. Kishan Reddy, senior leaders Bandaru Dattatreya, Indrasena Reddy and G. Lakshman were also arrested. Legislators of Telangana Rashtra Samiti (TRS), BJP and Communist Party of India (CPI) and those of Telugu Desam Party (TDP) from the region were arrested in the assembly when they staged protests against the arrests. Two TRS legislators who climbed on the assembly building and hoisted a black flag were brought down by police and arrested. Other party legislators conducted a mock funeral of chief minister N. Kiran Kumar Reddy in the assembly premises. The protests by legislators led to the adjournment of the House for the day. A rally led by TJAC convener Prof. Kodandaram near Indira Park also raised the heat for sometime before it was successfully thwarted. The police fired tear gas shells and also rubber bullets in their attempt to restrain them from surging ahead upto the state Assembly. A bike rally taken out by the students of the Osmania University was also scuttled at the varsity entrance. 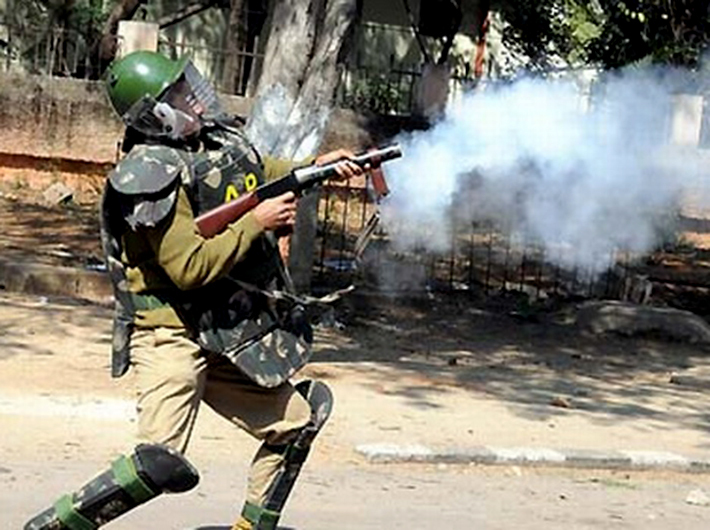 A pitched battle ensued as students retaliated by pelting stones prompting the police to fire tear gas shells. MPs Manda Jagannadham and Vivek, who recently joined TRS, KCR’s daughter Kavitha, TNGO leader Swami Goud and scores of other leaders were among those detained throughout the day.